How much weight you have lost from your peak ? I went from my high weight of 272, down to my lowest weight, of 191.8 (for an 80 lb loss) in less than 1 year. The first 50 or so lbs were from healthy diet alone. Then I hit a plateau for a couple months. That's when I started exercising really hard, both weight training and cardio, and lost the remaining 30 lbs. What are the key behaviors or tactics that you think have enabled you to succeed ? Key bad habits I dropped ? EVERYTHING I USED TO EAT! I went from not exercising at all, to working out like a freaking mad man, pretty much 6-7 days a week. Varying muscle sets of course. If someone reading this has repeatedly tried and failed to change their life for the better and they are considering giving up do you have any words of encouragement for them ? Ya' know, I'd really like to say (and have said, about my fishing, my photography, or anything I have had good success with) the old cliché, "if I could do it, anyone can do it....". To be totally honest, I'm not sure if this is true. Ya' see, I have this little thing which is typically looked at as a psychological issue, or problem, called obsessive / compulsiveness. So, many years ago, when I decided I was going to catch some big fish, I just put a stupid amount of my time and energy into doing just that. And so I succeeded. Never mind that I blew off having a real career, or possible retirement someday. So now, in typical fashion, I just decided to go off of the deep end with health and fitness. Knowing myself, I'm pretty sure (barring any unforeseen injuries, or illnesses) that I'll end up in jaw dropping, head turning physical shape, but that's pretty much because I think about my weight and muscle mass 24/7. Clearly you are a keen fisherman, how has losing weight affected your sporting life ? As for my fishing, on the one hand, my time on the water has actually been cut into just a bit by my workouts (and gas prices !) but then again, I feel so freaking good nowadays. It not only makes fishing more enjoyable, but it makes EVERYTHING fun, more enjoyable. So anyway, I'm not sure if this what you wanted to hear. I mean, how can you teach somebody to just throw out 90% of every important thing that normally runs through their minds, and replace it all with health and fitness X's 100 ? Would you even want them to do that ? One things for sure, if they did do this, they would almost certainly end up reaching 99% of their genetic potential or more. Anyway, I guess there a lot of worse things for a person to go off of the deep end with, other than health and fitness, huh ? Finally, stay tuned. I'm just getting started. If I could make this kind of change in 18 months, I can't wait to see where I'm at by my 50 B-day That is about 42 months. Can you tell us how long you have been working on transforming your body ? I've been working on transforming my body for a long time, almost 5 years! I can say that despite me wanting to change my body over these 5 years, I was only 100% committed in my diet and training for the last 5 months. In these past 5 months however, I have seen enormous changes in my body, due to adherence to only a few key principles. Commitment and devotion to training and diet are the key to the results that we all want! For the first 4 or so years, I knew very little about proper nutrition for building muscle and burning fat, but after the years of stagnant progress and minimal changes in my body and appearance, I decided to dedicate myself fully to learning everything I could about nutrition and exercise. I believe very much in the old cliche "you only get what you put in". This saying undoubtedly rings true in many different areas in life, but I feel that it really applies to bodybuilding / exercise / improving one's health and quality of life. Consistency (In training and in diet). I train 4 days a week, and never miss a session. As for my diet, I personally stick to a "targeted low carb diet", taking in a relatively low number of carbs (around 70 grams per day on training days, less than 50 grams on off days) 6 days per week, with the majority of my carbs being ingested directly pre- and post- workout. As I began to maintain consistency, I saw the gradual changes in my body, and became almost addicted to the feeling of bettering myself in the gym and seeing the results in the mirror. Motivation It's completely natural to sometimes lack the drive and desire to get into the gym and maintain a healthy diet day after day, week after week. I keep myself on track and motivated in a variety of ways; I keep a mental image of what I want my body to look like in my head, and think about how great I'm going to feel once I achieve this long term goal, and having my "dream body". This type of mental imaging and goal setting is powerful and motivating. I look to others as motivation as well! I have an enormous folder of inspirational images and quotes on my computer, that I often find myself looking at before I head to the gym. 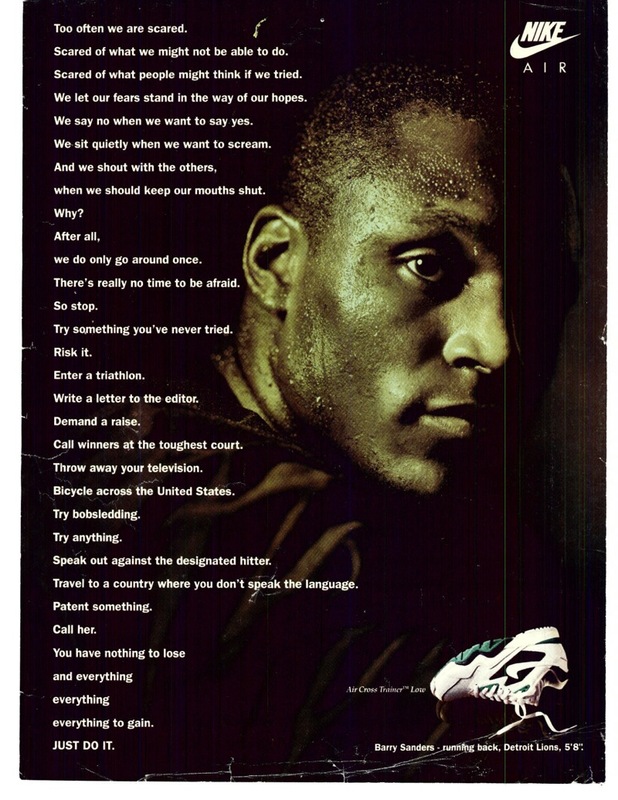 One of my favorite motivational quotes comes from a 1995 Barry Sanders Nike ad. It might be a Nike advertisement, but the message behind it is very inspiring to me. I also make sure to keep my I-Pod loaded with music that gets my blood flowing and gets me pumped up to have a great session in the gym. Knowledge (Learning about different exercises, techniques, dieting principles, and nutritional information has been incredibly helpful to me in my pursuit of a body that I am happy with. For years I didn't know about what to eat, when to eat, how much rest / recovery time my body needed, and what types of exercises would suit my goals best. I learn new things about nutrition and exercise every day, and with this new found knowledge, I'm able to maximize the time I put into the gym, and thus see results faster! Patience It took me over 5 years to achieve what I thought would be a short term goal. The reason it took me so long, is because I lacked the four very basic principles I have outlined here! [ consistency / motivation / knowledge / patience ] I lacked consistency, in that I would commit myself to exercise for a few weeks, and then neglect my training for weeks or sometimes even months on end! In addition, I knew little about nutrition, so much of the time I was putting in at the gym wasn't being used to its full potential anyway due to my lack of knowledge! I lacked the motivation to change my habits, my body, and my life, because I wasn't seeing immediate results! Results in the gym don't happen overnight, they happen over weeks and months of consistent work and proper nutrition. That doesn't mean that it's going to take someone 5 years (like it took me) to achieve their goals, because in fact, I feel like if I could do it all over again, putting in 100% effort in consistency, keeping myself motivated, attaining relevant knowledge, and maintaining a little bit of patience, I'm extremely confident I could have made the same transformation in well under one year! Use the small improvements you see and feel in your body and mind as motivation, and always remember your long term goals. Has your change in lifestyle affected your life in any ways you didn't expect ? My change in lifestyle has affected my life in a variety of positive ways, many of which I didn't expect. Throughout high-school and most of college, I found it difficult to stay on track and get my work done. I was disorganized and unmotivated. As I began to take control of my diet and training, I began to feel more confident, and this translated directly to other areas of my life, like my academics. At one point in my college career, I felt as though graduating and getting my degree was unlikely. I had trouble focusing on school, because I was unhappy with my body, and lacked self-confidence. With my improved body and new found self-confidence, I raised my GPA from a 2.3 to a 3.5, and was able graduate from the University of Connecticut earlier this week, with a BA in English. I attribute the change in my academic habits to the change in my approach to nutrition, training, and my overall lifestyle. I know how you feel, because I've been there so many times before. I've felt unmotivated, discouraged, and defeated. You owe it to yourself to do the things that motivate you and make yourself feel great, and if one of those things is improve your body, then you need to know that you can absolutely, 100% do it, as long as you really want it. Nobody is going to change your body or your life, except you, and the determination you have. There are no miracle diets, pills or supplements that are going to do it for you. It has to come from within, and when you do make the changes in lifestyle and training that lead to the body you want, you will have a great sense of accomplishment and achievement, knowing that you did so with nothing but your own determination and will. Can you tell us how much weight you have lost from your peak ? I started at 235 lbs in April/May 2010 when I realized i was a fat slob and being fat would make achieving my dreams harder. My most important goal is to be happy. In the following 11 months I got down to 162 lbs. The will to do it. This enables you to do everything else, it is a very powerful instrument. I became very disciplined when I imagined that now exactly this second was the most important time of my life, it literally was. I imagined my life in 20 years without losing weight - a fat single loser with social anxiety- and if I accepted the challenge I would be able to be happy and enjoy life. I am not the same person as one year ago, my life turned 180°. Other key behaviors where, of course, eating habits and my gym membership. Do you think adopting new healthy habits or dropping unhealthy habits has played a big role in your transformation ? Isn't this one obvious? A calorie deficit is a temporary healthy habit ! Without a deficit you can't lose fat, therefore dropping the inflationary consumption of (fast) food was essential for my fat loss, as was my increased physical activity. If you have the will you can do anything in life. Unless you understand this and develop the will to change something you will always stay the same. For further motivation look for motivational images on the bodybuilding.com forum. My highest documented or what i did on scale was 280-195.5 lbs (127kg - 88.4kg), my lightest. The biggest thing was logging my food and going from there. I log 5-7 days a week unless i'm on vacation. From here you can tweak your diet each week or two. Also, the way i did it was slowly. I didn't jump into it all like many or most do. I took 1-2 months and slowly tweaked my diet over time. Towards end of the two months I simply started walking. Around the third month I started with the gym and during the forth/fifth month i got serious in the gym researching exercises and splits more. I guess what i am saying is that I believe lots of people that fail, fail because they try doing everything at once. When I talk to people and help them I have them spend the first month logging their foods and work on eating better slowly. For example, stop late night snacking one week, then the following week no eating fast food. Slowly work on things. Definitely, thats pretty much common sense friend. Well i guess not following your diet for a day or even a week does NOT mean you failed. Just pick yourself up, dust off and get back to healthy living. Also see the previous question for what my game plan was. We will all hit hurdles in life where it will be VERY difficult to follow through on diet and exercise. If someone feels the need to go out and eat a good, ie fattening meal, its ok to do now and then. As a matter of fact if you can be strict with your diet mon-fri i've always had a cheat meal on sat and one on sunday and sometimes binged pretty badly, but overall month after month i was losing weight. Of course if weight loss is stalling you need to work on taking out or reducing these cheat meals. So I guess dont give up just because you'll blow up one day. See what you did, work on fixing it and move along! A total of 136.6 Lbs (62 Kilograms). Making my own food, reducing ammounts (I don´t count calories), zero refined sugar in my food, banning fried food, desserts, ice creams, soda, fast food (once or twice a month is just enough), eating good fats every day (avocado, nuts, omega 3) and the most important in my opinion is reducing carbs, trying to get carbs only from fruits and salads and ocasionally rice or sweet potatoes. Of course we all need to stop being lazy and start walking, jogging, lifting weights, spinning, swimming, whatever you enjoy the most but the human body really needs to do some exercise at least 4 times a week. Of course, it was 100% of the success. I can only speak from my experience, I was a healthy morbidly obese person, but for how long? I used to hate pictures of myself, I was really mad when i looked myself in the mirror. I´ve been alone for years, no girlfriend and not going out because i was ashamed of myself. If you identify with these things, well, you need to change. The best feeling in the world is when people see you on the street and make this big amazing surprised face because you are looking younger, great and healthier. Another great feeling is to fit in normal size modern clothes. Are you demotivated? Find the reason! Take a picture of yourself every month so you will see the changes and be motivated every time. Know that you are eating to keep your body healthy and fine. Just think in long term, your body will thank you for that. When you reach your goal, you will feel powerful, invincible, that you can achieve whatever you want in life. Let me tell you that this feeling leaves you speechless and so happy every second of your life. It will worth the fight and the sacrifices, just keep doing it and results will come. My favorite quote: "If it is important to you you will find a way, if not you will find an excuse" , sorry, don´t know the author. Good luck and hope the answers are really good for you. English is not my first language so be patient while reading this. I went from 230 lbs (104 kg) to 140 lbs (63 kg) to 170 lbs (77 kg) and slowly recomped for two years. Now I'm going down to maybe 150-160 lbs (68-72 kg). Consistency. Never totally giving up. Some times it was hard but I always got back on track. Never try to go super strict, take it slow and steady. Somewhat. The main thing is consistency. I still eat junk from time to time but not as often as I used to. And I am way, way more active now than in the past. Never give up. Just keep trying. Take each little progress as an achievement and always try to go foward and never step backward. I've lost 124 lbs (56 kg) total so far but still dropping. Low carb dieting, with smaller portions. I started walking alot and once I hit 230 pounds, I started p90x. Im not done with the p90x yet, so no "after" pics yet. It GREATLY played into my transformation. It's a compounding effect. You start eating better and working out. Then you start feeling better and get more active, you start getting more active, you start working out more and it keeps going. I feel most people fail because they aim so high right off the bat. They look at the scale and say, "wow! i need to lose 50 pounds!" and it's such a big number and a far off goal that they get discouraged. You have to break that goal down. Don't say you have to lose 50 pounds, say you want to lose 10 pounds in 2 weeks. When you hit that 10 pounds go reward yourself with something nice. Then do it again. Next thing you know you've gotten your 50 pounds off and you didn't even realize it. If you want some encouragement or support Email us and tell us how your doing!